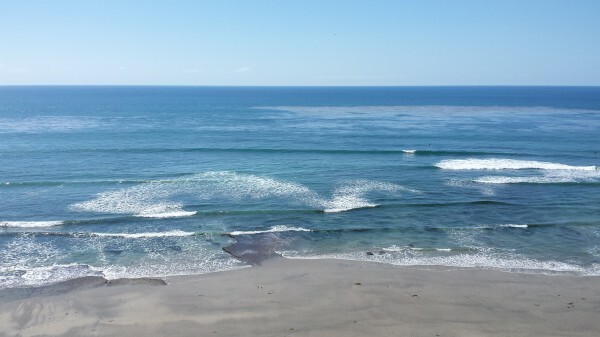 This is not “our beach.” This is the view over the cliffs from the meditation garden in Encinitas. The planes of the water look as if they were spread onto a surface with a palette knife, neatly squared off rectangles. The beach is flat and smooth, too, without the characteristic rounded stones of “our” Carlsbad beach. The meditation garden offers many beautiful plants and flowers, but for me it might not seem as enchanting if it didn’t have this spectacular view. It amuses me that the sea can look like a painted backdrop, an evocation of itself, one-upping its own glory! Slowing down to soak up this place doesn’t wear thin for me. Time stops, the carp swim in deliberate swirls, the groundsmen murmur, the meditators sit unmoving, the families swish by, and I try to inhale the peace.